The trial of the former Arizona Sheriff opened Monday over his defiance of the courts in traffic patrols that targeted critics say racially profiled Latinos. PHOENIX (AP) -- In opening arguments, prosecutors displayed comments Sheriff Joe Arpaio made in news releases and during TV interviews in which he bragged about immigration enforcement, aiming to prove that he should be found guilty of misdemeanor contempt of court. "He thought he could get away with it," prosecutor Victor Salgado said, adding that at least 170 were illegally detained because Arpaio didn't stop. "He never thought this day would come." Arpaio's defense lawyer vigorously disputed that a person with nearly 60 years in law enforcement would violate a court order, putting the blame on a former attorney who gave bad legal advice. Critics hope the eight-day trial in federal court in Phoenix will bring a long-awaited comeuppance for the defiant 85-year-old who led crackdowns that divided immigrant families and escaped accountability. His tactics drew fierce opponents as well as enthusiastic supporters nationwide who championed what they considered a tough-on-crime approach, including forcing inmates to wear pink underwear and housing them in tents outside in the desert heat. Arpaio spent nine of his 24 years in office doing the sort of local immigration enforcement that President Donald Trump has advocated. To build his highly touted deportation force, Trump is reviving a long-standing program that deputizes local officers to enforce federal immigration law. Arpaio's lawyers say the former sheriff is charged with a crime for cooperating with U.S. immigration officials, which the Trump administration now encourages. His legal troubles played a major role in voters turning him out of office in November after a campaign in which he appeared alongside Trump at several rallies in Arizona. The former six-term sheriff of metro Phoenix has acknowledged defying a judge's 2011 order in a racial profiling lawsuit by prolonging the patrols for months. But he insists it was not intentional. To win a conviction, prosecutors must prove he violated the order on purpose. His immigration powers were eventually stripped away by the courts and federal government, culminating with a judge ruling in 2013 that Arpaio's officers racially profiled Latinos. Arpaio's defense centers around what his attorneys said were weaknesses in the court order that failed to acknowledge times when deputies would detain immigrants and later hand them over to federal authorities. "He followed the law as the law exists," said Dennis Wilenchik, Arpaio's lead attorney. Prosecutors are seeking to use Arpaio's own words against him in their case. The sheriff's office issued a news release a week after the judge told it to stop the patrols saying it would continue to enforce immigration laws. Arpaio also gave a March 2012 TV interview in which he said his office was still detaining immigrants who were in the country illegally. Tim Casey, who defended Arpaio in the profiling case for nearly six years, was forced to take the stand against his former client, saying he had several meetings with the lawman to discuss the judge's order. 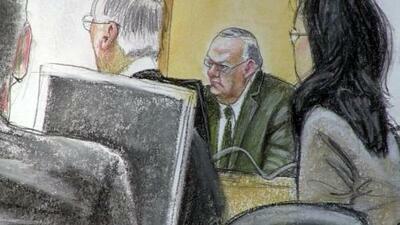 Arpaio rested his chin on the palm of his hand Casey reluctantly testified. The questioning got bogged down in objections over whether attorney-client privilege barred Casey from providing details of the conversations. Casey says he told Arpaio that his officers either had to arrest immigrants on state charges or release them. Prosecutors say Arpaio turned the detainees over to federal authorities in violation of the court order. It's not known whether Arpaio will testify in his defense.